And now we'll go into more detail on specific malware types. 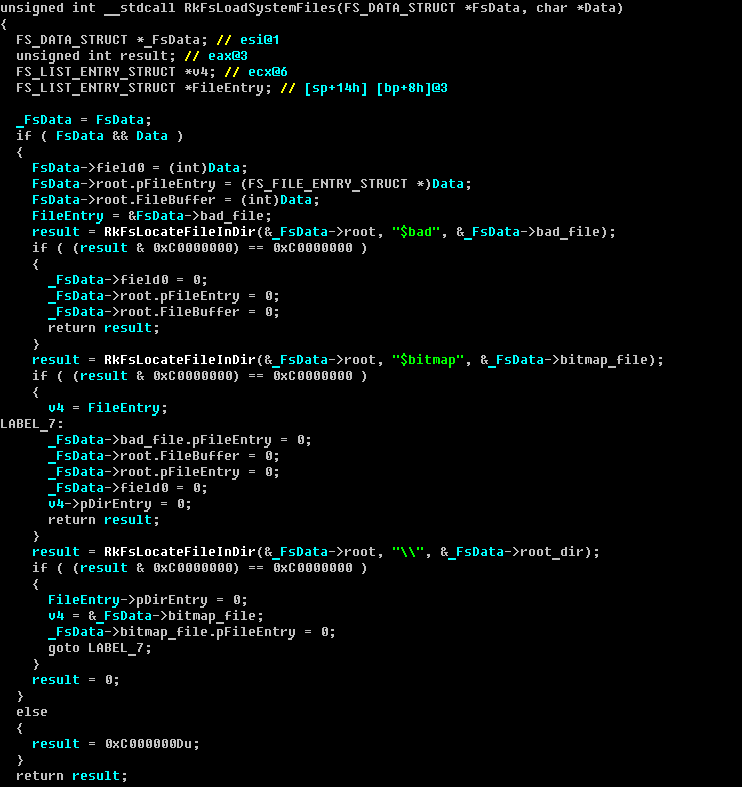 As we predicted in 2010, TDL4 (Win32/Olmarik) has been evolving over 2011. Its developers attempted to bypass the KB2506014 security update, which addressed a vulnerability allowing abuse of WinPE mode. When the malicious boot code receives control it locates TDL4’s hidden storage and continues the boot process using the malware’s bootkit components. The VBR of the malicious partition mimics the VBR of the legitimate NTFS partition: this approach makes Win32/Olmasco stealthier and therefore more difficult to detect. Early in 2011 a new 64-bit ZeroAccess (Win32/Sirefef) modification appeared in the wild. Unlike TDL4 and Win32/Olmasco it doesn’t implement bootkit functionality. Although there is a version of the malware targeting 64-bit systems, it doesn’t contain a kernel-mode driver. 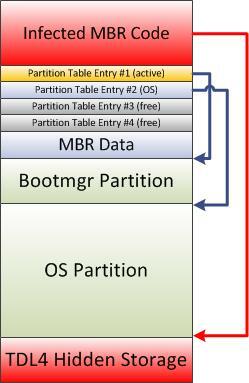 The only ZeroAccess version which does include a driver targets x86 systems only. For this reason, the machine-infection algorithm is different for 32- and 64-bit Operating System versions. On x86 systems ZeroAccess behaves like the TDL3 rootkit. It infects a kernel-mode boot start driver by completely overwriting the driver with its own code. As a result, at boot time the system loads the malicious driver, not the original, legitimate code. In order to protect itself against security software and to conceal the fact that the driver was overwritten it sets up low-level hooks in the storage device driver stack. Infection works differently on a 64-bit OS. Since there is no kernel-mode 64-bit driver, the malware drops consrv.dlllibrary into the “systemroot\system32” directory and registers it as part of the Windows Subsystem, which the Session Manager Subsystem (smss.exe) process (trusted system process) has to load during system startup . The list of subsystems which need to be loaded is stored under the Required value of the “HKLM\SYSTEM\CurrentControlSet\Control\Session Manager\SubSystems” registry key. If one of the components of “required” subsystems is missing the system is rendered unbootable. This issue should therefore be taken into account while removing the threat from the system: deleting consrv.dll without applying corresponding changes to the registry key will break the system. 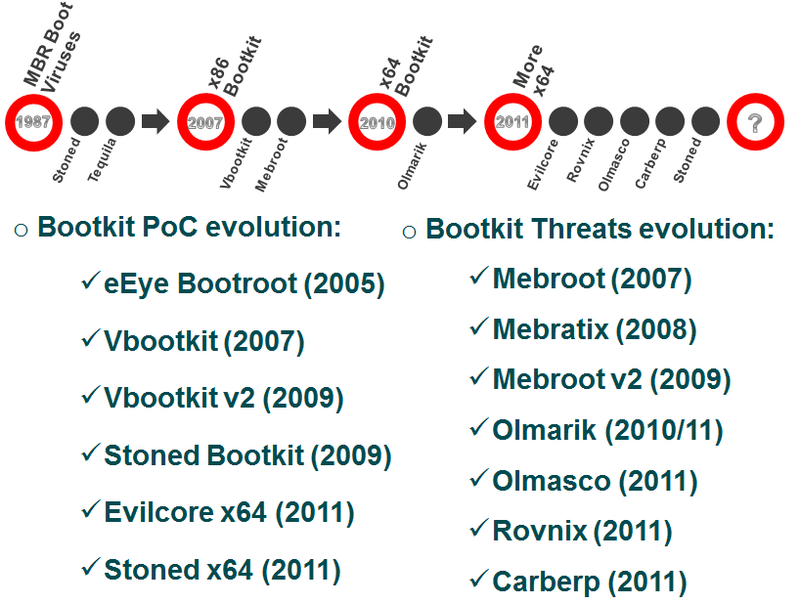 In 2011 a new bootkit – Win32/Rovnix – established a new trend: Modifying the VBR and Bootstrap Code (Win32/Rovnix, Win32/Carberp). Using such a technique allowed malware to bypass many security and antivirus programs since the feature makes detecting and removing these threats more difficult. Another interesting fact is that the bootkit builder for VBR bootkits like Win32/Rovnix was offered for sale. 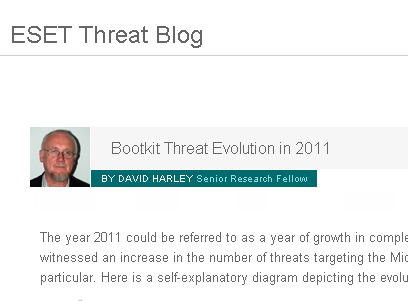 For instance, Win32/Carberp – one of the most dangerous banking trojans – was upgraded to include bootkit functionality. Its developers started testing the for-sale bootkit in the end of the summer. We also observed that more and more complex threats started using their own hidden storage and avoided relying on services provided by OS. This approach allows malware to keep its payload and configuration data secret where antivirus and security software is less likely to find it. To conclude this article, we compare briefly the hidden file systems of the most sophisticated of these threats: Win32/Olmasco, TDL4 and ZeroAccess. As the successor of TDL3 and TDL3+ this family of malware inherits almost all the features of its predecessors regarding the storage of payload modules. It reserves some space at the end of the hard drive for housing its file system, the contents of which are protected by low-level hooks and an RC4 stream cipher. We performed much more in-depth analysis of TDL4 in the white paper “Evolution of TDL: Conquering x64”. Better management of internal file system structures. Unlike the TDL4 hidden file system, which is only capable of storing files, the system implemented in Win32/Olmasco could store both files and directories. The root directory is denoted with the backslash symbol ‘\’, as is usual with Microsoft systems. Both of these files are at the same hierarchical level in the root directory and are not accessible for payload (i.e., they’re for system use only). The purpose of these files is to store information about unused space and sectors containing corrupted data (just as files with the same names are used in NTFS). Another reason for introducing these files is to make the file system resemble NTFS more closely, so as to confuse security software. 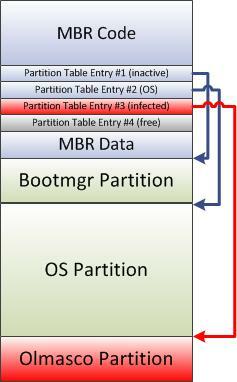 Yet another malware family that implements its own hidden storage is the ZeroAccess rootkit. Like TDL4 and Win32/Olmasco, ZeroAccess stores its payload and configuration information in a custom hidden file system. In this case, however, the contents of the hidden storage are saved into a file in the OS file system rather than directly into hard drive sectors. For this reason, ZeroAccess creates the directory “WindowsDir\$NtUninstallKB_BotId$\BotId” into which payload and configuration information is stored. In this case, the malware behaves like a file system filter driver: it redirects payload read/write operations to corresponding files in the system, as well as performing transparent file encryption.